From February 20 – 23 Africa Lead, Feed the Future’s primary capacity building program for food security in sub-Saharan Africa, held a four day learning event. The event focused on celebrating lessons learned from five years of programming and developing recommendations for near-term and future activities. The microsite provides as many resources from the event as possible, for attendees of the event or those who were not able to make the event to be able to dive in the content; the event, the successes celebrated, the lessons learned, and the recommendations developed. Navigate using the tabs above to begin learning from Africa Lead II’s four years of programming. Africa Lead held a four-day Lessons Learned Event (LLE) in Nairobi, Kenya. The purpose of the event was to capture lessons learned and generate recommendations for near and long-term food security capacity building efforts. Over 100 participants from across sub-Saharan Africa reflected on the continental project’s past four years and discussed opportunities for additional food security and capacity building programming, as well as how to ensure the sustainability of existing programs. Non state actors, government partners, and Africa Lead and USAID staff from Washington, DC and across the continent reviewed the project’s efforts to support continental, regional, country, and sub-national level progress in achieving the goals of the Comprehensive Africa Agriculture Development Programme (CAADP). The event consisted of full day pre-event focused on lessons learned from USAID-Kenya’s Partnership for Resilience and Economic Growth (PREG). Following the pre-day, Africa Lead kicked off a three-day learning event focused on developing a report on key lessons learned that can inform future African-led food security efforts. 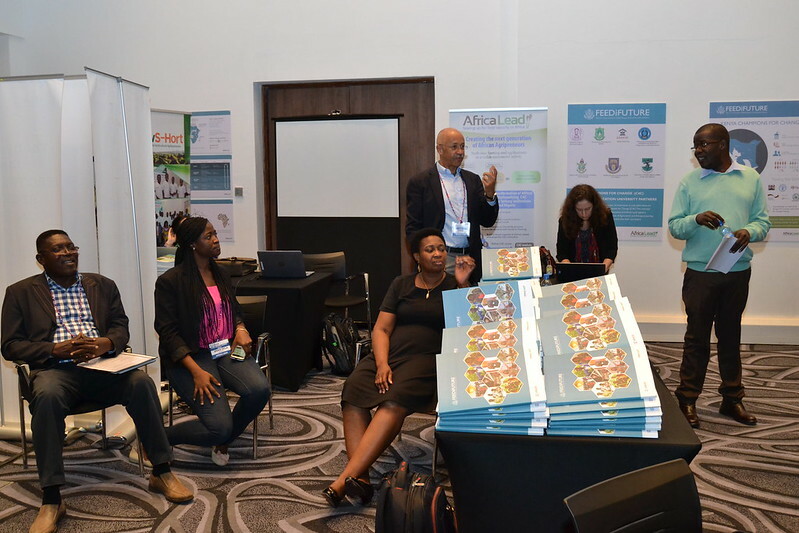 Africa Lead employed a combination of presentations, plenary discussions, thematic group breakout sessions, and an interactive ‘Gallery of Transformation’ exhibit, featuring 22 thematic presentations and infographics. During one session, Africa Lead launched highlighted findings from the Program Review that measured results across the project. In his opening remarks, Patrick Wilson, Acting Mission Director for USAID Kenya and East Africa, reflected on the importance of food security work, after taking a tour of the event’s Gallery of Transformation. “This is about Africa governments… civil society… farmers… setting the agricultural agenda, changing the state of this continent. And I’m convinced, when Africa leads, Africa wins,” he said, urging participants to keep working towards a food secure Africa. Other key highlights from the workshop included discussions on the legacy of Africa Lead’s Champions for Change (C4C) program and ways to improve it in the remaining period. Participants also discussed successes of the CAADP biennial review process and the institutional architecture efforts that Africa Lead is currently championing within national agriculture planning efforts. Additionally, speakers presented eight thought pieces based on Africa Lead’s lessons and experiences, followed by group discussion and analysis in breakout sessions. Gilead Teri, Director of Policy, Research, and Lobbying at Tanzania Private Sector Foundation (TPSF), reiterated that inclusion of private sector associations is crucial in policy spaces, especially for countries with a growing agricultural sector. “These policies and reforms need to be leveraged and the private sector expected to invest,” he said. Speaking at the event’s closing ceremony, Chris Shepherd-Pratt, Bureau for Food Security Division Chief for Policy, said, “It’s important to keep in mind that your work, experiences and voice will translate to people long after [the project’s] ending. African countries and leaders have now come together for ambitious needs to meet food security.” Chris emphasized agriculture’s importance in realizing development goals in sub-Saharan Africa and urged participants to take it seriously. As a follow up to the event, Africa Lead will share with partners combined lessons learned and recommendations in a Lessons Learned report. Various Lessons Learned activities will serve as a follow up to the event, including a Lessons Learned Event for Ghana-specific activities currently scheduled for mid-March 2018.